Hi, I’m Andrew (Andy) Mart and live in Hatch Warren and have lived in Basingstoke all of my life. 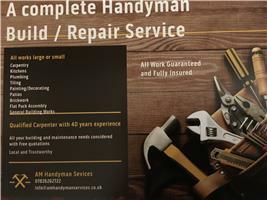 I am a Time Served Carpenter and have traded as a General Builder in Basingstoke for around 25 years. As a Sole Trader I try to give a personal service and always come to your premises and give a free quotation for the jobs you need doing. I also have DBS Clearance which is Certified. I will be honest with my start dates and booked work commitments but will always try and fit jobs in where I can. Basingstoke, Oakley, Hook, Candovers, Dummer, North Waltham, Tadley, Kingsclere.